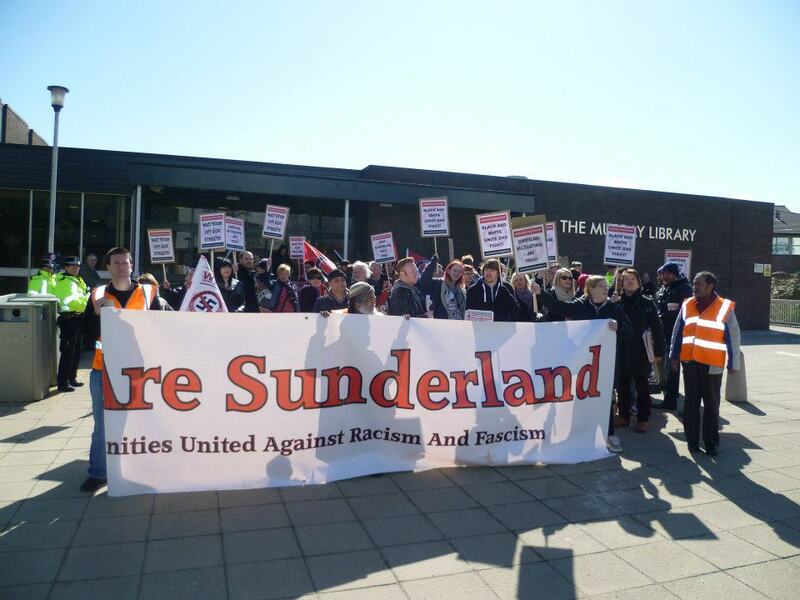 On Saturday 30th March the ‘Sunderland Anti-Fascist Coalition’ (SAFC) staged yet another demonstration in opposition to far right organisations, who are regularly taking to the streets of Millfield in Sunderland to spread racism and hate. On this occasion it was the English Defense League (EDL), North East Infidels (NEI) and Scottish Defense League (SDL) who were the most prominent of the fascist groups. This was the ninth anti-fascist demonstration in eight months, and the second largest so far. At 11.30am around 100 people gathered at the University’s Murray Library on Chester Road to take part in the anti-fascist event. They signed the ‘We Don’t Mind the Mosque’ petition and read the leaflet providing a rough plan for the day. Then they marched up Chester Road and along St. Mark’s Road in a fine display of multi-culturalism and solidarity. Various banners and scores of SAFC placards created a colourful sight, and the chanting brought local residents out of their homes to observe. The demonstrators were met by police near the end of St. Mark’s Road and moved into the demo point next to the site of the proposed new mosque. The fascists, meanwhile, were getting drunk in various pubs nearby. Police officers in lime green jackets, some on horseback, swarmed over the whole area. 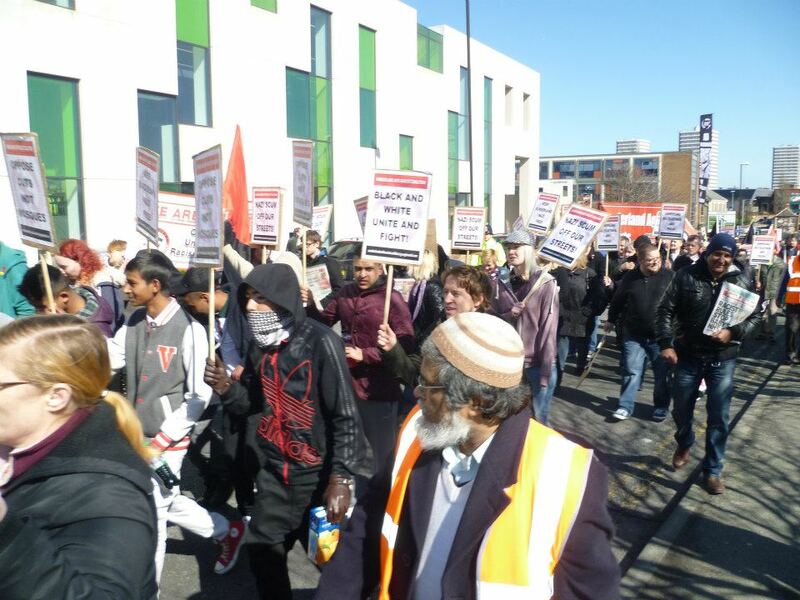 The SAFC organisers expected the fascists to come out of the pubs when the anti-fascist demo began at the mosque. However, this was not the case, and demonstrators had no choice but to wait around for the fascists to finish their drinking session. Entertainment was provided, however, by the odd fascist having a go and getting arrested. The police informed the main organiser that the march back to the Murray Library had to begin at 1.30pm. This information was conveyed to the rest of the demonstration around 1.15. There was strong opposition to the police’s demand because the protesters were yet to see and oppose the fascist demo. The organiser then negotiated with the police and won an extra half hour. Everyone thought the fascists were sure to arrive well before then. Unfortunately they didn’t. The fascists kept the opposition waiting and waiting. An agreement between fascists and police meant the fascist demo had to begin by 2 o’clock or it would not go ahead. But this was the time the police wanted the anti-fascists to leave the area. Fearing further resistance to this restrictive time period, the police served the main SAFC organiser with a section 14 notification which forced him to comply or face arrest and prosecution. Again the organiser announced the developments to the whole demonstration. The threat of arrest, not just to the main organiser but also the six stewards and others, was a cause for concern. A minority of anarchists who had played no part in building the demo, led by a person from a town 30 miles from Millfield, began agitating to stay. This annoyed the officials and the supportive majority who were not keen to clash with the police and get arrested. The organisers and their supporters had not come to get arrested. Their intention was to have a peaceful demonstration and avoid any law-breaking and bad publicity. The organisers took the difficult decision to march back at 2 o’clock and informed the rest of the demo. The anarchists continued trying to get people to stay, despite the fact there would be arrests and restrictions on future demonstrations. Then the fascists appeared from Hylton Road and made their way into a designated area on the grass opposite the mosque. They were greeted with chanting from the anti-fascist demonstrators as they prepared to march off. The police became quite insistent that the anti-fascists must begin their march back, and police horses were used to force the marchers along the road. There was a lot of commotion caused by the anarchist minority as the march got under way. The police were verbally abused by the anarchists, which again put people at risk of arrest. Some naturally felt deflated on the way back to the University as the police had denied them the chance to oppose the fascists directly. But complying with the orders of the police was necessary to avoid arrests and bad publicity, and most people agreed with the decision to leave at 2 o’clock. Defeating fascism requires a long term strategy and cannot be achieved in one day. The movement must expand massively if the fascists are to be isolated and rendered impotent, and that requires peaceful demonstrations that appeal to those not yet onboard. The anarchist minority clearly don’t understand this. These people, who had been willing to get others arrested at the mosque site, began abusing fellow anti-fascists on the way back to the University and denounced the organisers for cooperating with the police. They attacked comrades from the SWP and Labour Party and chanted “SWP off our streets! !” in a disgraceful display of sectarianism. Arguments broke out as people were offended by these insults. One anti-fascist was almost arrested after he reacted verbally to the abuse. Back at the Murray Library, the main organiser closed the event with a positive speech while a minority of anarchists hurled abuse and promised to divide the movement and hinder further demonstrations. One of them approached the organiser and demanded the megaphone so he could close an event he played no part in building. The organiser refused. Then demonstrators listened to Barry Hyde from successful Sunderland band The Futureheads who had come along to show support and play a few songs. And so it ended with neither a great victory for anti-fascism nor major defeat. It was merely an evolutionary stage in the process of fighting fascism in Sunderland. 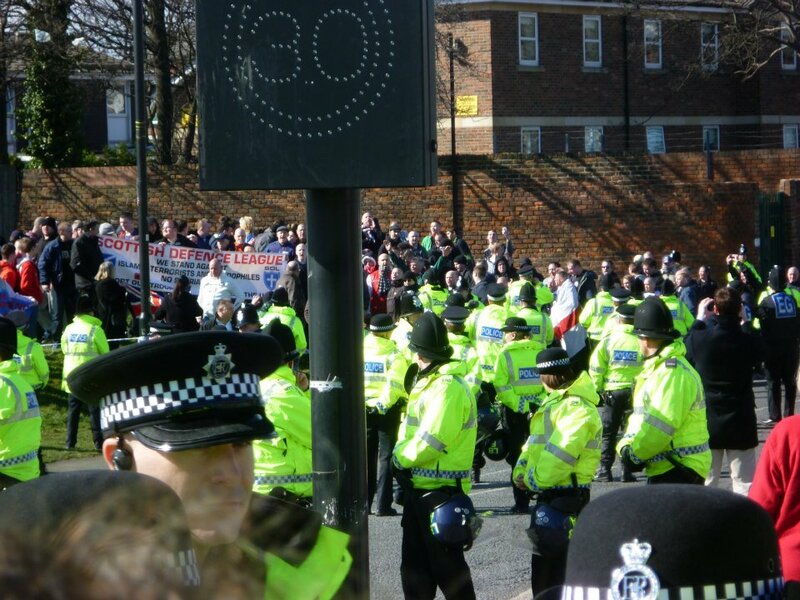 The fascists were stronger in number than their last major Sunderland demo in October – but for a national mobilisation it was still quite pathetic. There were, at the very most, perhaps 120 fascists. Moreover, they hardly even protested, as they went back to the pub shortly after the anti-fascists departed and continued their Easter drinking. They also suffered three arrests. The numbers on the anti-fascist side were slightly lower than October 6th – but there were reasons for that. For starters, the students were on their Easter break, and many activists were kept away by union conferences and the Bedroom Tax protests going on elsewhere in the region. Plus, some train and Metro services were off, which affected people’s ability to get to Sunderland. On the plus side, in attendance were members of several major unions, including Unison, UCU, PCS, Unite, GMB and RMT – plus Labour Party, SWP, Socialist Party, Green Party and UAF members. There was also a good number of white and Asian Millfield residents. One positive step forward was semi-support from non-fascist opponents of the mosque. Two members of the local residents’ group told SAFC organisers they had physically prevented the EDL and NF from entering their meetings. They may not be convinced of the need for a mosque, but at least they’re opposed to fascism, and that’s something to be grateful for. And the gap between the fascists and local residents is sure to widen when locals get wind of the following information. It has been revealed by ‘Hope Not Hate’ activists that a charity shop on Chester Road is being used to raise money for the fascist EDL under the guise of ‘Help For Heroes’. The people at ‘Help For Heroes’ are disgusted to learn of this fraudulent use of their name and have confirmed they have no connection to the EDL or said charity shop. See link below. So that was the demonstration. Now we have to do something about the fascist football manager. Please support us in any way you can. We’d also like you to respond to this report and tell us what we can do to make future demonstrations bigger and more effective. Finally, it should be noted that while a small number of anarchists caused trouble for the SAFC organisers on the demonstration, it certainly is not the case that all anarchists are divisive and sectarian. Indeed some anarchists attend SAFC steering group meetings and take on responsible roles when serious activity is needed. We salute those anarchists who remained devoted to solidarity and respected the SAFC organisers in a very awkward situation on Saturday. Gary Duncan – Chair, Sunderland Anti-Fascist Coalition. The International green socialists appreciate feedback which you can write below and all comments will receive a response. If you want to write something else for the IGS, contact us on facebook. All help from like-minded people will be welcomed. 2 Responses to Sunderland anti-fascist coalition builds resistance to racist poison. What I do not understand is why on gods earth did you lot turn up so early, when it was PUBLICLY ANNOUNCED clearly on the internet (easy to find) that the opposing side would be drinking in Jollies till about 1.45 / 2pm? You’d really have to address this question to the SAFC https://www.facebook.com/groups/161137023971619/ but we do know that thousands of leaflets were put out in advance and it certainly wasn’t therefore a mobilisation organised online.